We recently needed to migrate our own internal MDaemon and SecurityGateway server to a new location. Luckily we often do this for customers and we have guides specifically written to help with this process. However one of the areas which we felt we haven’t documented before is how to also migrate an existing SSL certificate that was being used by multiple services in these products. Even though you might be using a Self Signed SSL certificate, migrating this across to a new server is important, if you didn’t do this and simply created a new self signed certificate any clients that connect to your service would receive a new warning prompt that could indicate a problem with the certificate and generally users would begin to ask questions. For larger installations this is defiantly worth avoiding where possible! 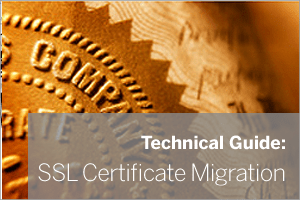 The actual migration of an SSL certificate between servers is actually not specific to the application or service using it in any way, so in effect this process could equally apply to MailStore, Microsoft IIS, or indeed any other Windows application or service. For a full run through of the steps that need to be taken to move it have a look at this new knowledgebase article here.